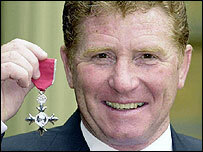 Hundreds of mourners have turned out for football great Alan Ball's funeral at Winchester Cathedral. His coffin was draped in an England flag with a traditional flat cap upon it, and a speaker relayed the service to the crowds gathered outside. 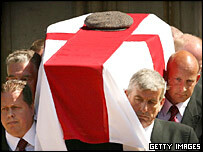 The 61-year-old member of the 1966 England team was found dead at his home in Warsash, Hampshire, last week. He died of a heart attack while putting out a small fire that had broken out in a compost heap in his garden. Tributes offered at the funeral were led by Ball's son Jimmy, 31. His mother, Ball's wife Lesley, died three years ago from cancer. In an opening address at the service, former team-mate Nobby Stiles remembered how Ball gave him a fresh burst of energy during the World Cup final, even when he felt he had no reserves left. He said: "My most enduring memory of Alan is in the World Cup Final. "I think all the lads would agree, he was the best player on the pitch. "He covered every blade of grass." In an opening prayer, before leading the congregation in the hymn Jerusalem, Canon Michael St-John Channell said: "We are all here to share that strange mixture of sadness and joy, sadness at saying farewell and joy at Alan Ball's gifts." Speaking outside the cathedral before the service, former Southampton manager Dave Merrington, said: "His awareness and perception of the game was absolutely terrific. "The thing I liked about Alan was when I worked with him he was a simple guy - what you saw was what you got." Dave Watson, who played alongside Ball for England and Southampton, described his memories of the midfielder: "He was a model professional, always perky, always optimistic and a great example to everybody else. "He was enthusiastic and it was catching, you know. You never saw the dark side." Ball was the youngest member of the England side that won the World Cup in 1966. Several members of the squad attended, including centre-half and former Republic of Ireland manager Jack Charlton, goalkeeper Gordon Banks, full-back George Cohen and striker Roger Hunt. 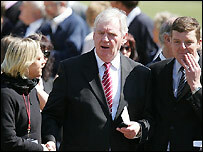 Lawrie McMenemy, who signed Ball for Southampton, remembered him as an outstanding role model. He said: "He was a wonderful example to all the young players we had." Former Arsenal and Scotland goalkeeper Bob Wilson, who played alongside Ball at Highbury in the 1970s, said: "Well, he was a magnificent footballer, and a magnificent human being. "You know, he's just an infectious character, an enthusiast, not just for football but for life itself. "Everybody here today just loved the little guy, and we're going to miss him." Ball won 72 caps for his country in a 10-year career and made a total of 743 League appearances for Blackpool, Everton, Arsenal and Southampton. He went on to manage seven clubs including Manchester City, Southampton and Portsmouth. Before introducing the final song, Frank Sinatra's My Way, Jimmy Ball thanked the packed cathedral and drew the service to a close by reciting Rudyard Kipling's poem, If. He said: "If you can fill the unforgiving minute with 60 seconds' worth of distance run, yours is the Earth and everything that's in it, and - which is more - you'll be a man, my son. "Well he was a man, probably the best I ever met." Ball is also survived by his two daughters, Mandy and Keeley.